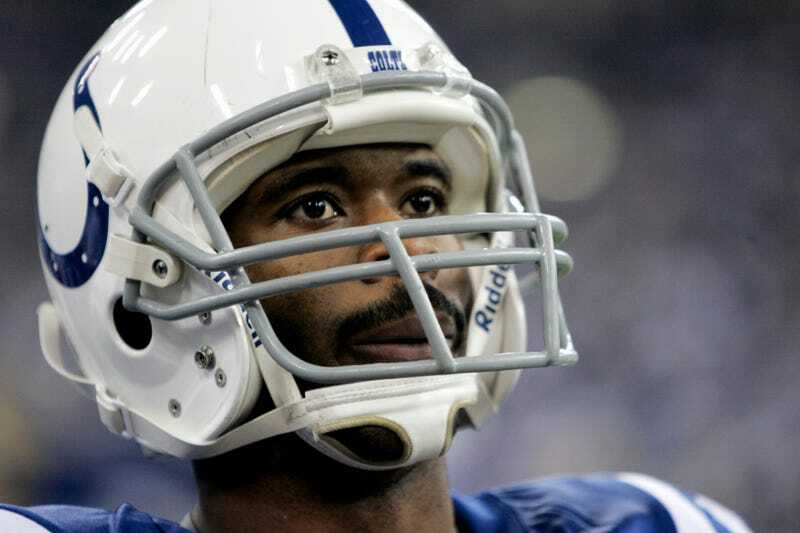 Remember When Marvin Harrison Was Implicated In A Shootout? On Saturday, former Colts wide receiver Marvin Harrison will be inducted into the pro football Hall of Fame. His induction will be met with the typical amount of fanfare, as writers will rush to remind you how crisp Harrison’s routes were, how durable he was, and how he was always a quiet competitor. You probably won’t hear too much about how close he came to being charged with attempted murder. “Remember when Marvin Harrison probably shot that guy?! ?” is a phrase you’re likely to hear any time Harrison’s name comes up in the presence of more than a few football fans. Still, it’s worth revisiting the details of the case as often as possible, because it’s one of the strangest in which an athlete of anything near Harrison’s caliber has been involved. Your guiding light here is Jason Fagone’s feature that ran in the February 2010 issue of GQ, which lays out the narrative of the case alongside some truly eyebrow-raising pieces of evidence. Nixon saw Harrison get out of his car and exchange words with the fat man. He couldn’t hear the words, but he could see the gestures of threat and counterthreat. The fat man stayed in his car. He called somebody on his cell. Harrison got back into his car and called somebody on his cell. After a minute or two, Harrison got out of his car for the second time. Nixon was across the street and thirty yards away when Harrison started shooting. Pop pop pop pop pop pop—a great staccato gust of bullets. Steadily, Nixon says, Harrison unloaded both guns into the fat man’s car, stippling the red Toyota Tundra with bullet holes as the fat man ducked in his seat. Eventually, the fat man sat up and sped off, heading straight toward Nixon’s position as Harrison darted into the street and continued to shoot. When Nixon was first questioned by police at the scene of the shooting, he told them that he hadn’t seen anything. He would later tell police the same story he gave Fagone, a story that lined up neatly with the rest of the evidence the police were able to gather. But in January of 2009, the Philadelphia District Attorney deemed Nixon’s testimony to be unreliable, and announced that no charges would be brought against Harrison. A. I brought it today, twenty minutes before you came. Q. Are you saying that the 5.7-cal handgun that you own was in the safe at your home up until today, when you decided to bring it to your shop in the 2500 blk. of Thompson St.? That “yes” is the sound of a trap snapping shut. Harrison says his gun hasn’t been fired since 2006 or 2007. That’s impossible. Fresh casings exist, so the gun had to have been fired. But by whom? Harrison says he doesn’t know. All he knows is that the gun couldn’t have been lent or stolen, because it was locked away the whole time in his suburban safe. Only it couldn’t have been in the safe, either, because it had to have made an appearance at the corner of 25th and Thompson. Harrison’s story makes no sense. Dixon survived the gunshot wounds he suffered outside of Harrison’s car wash. On July 21, 2009, he was shot to death while sitting in his car outside of a diner located half a block from a bar owned by Harrison. Surveillance video from a nearby convenience store showed the suspect, but shadows made it impossible to identify him. According to Fagone’s sources, cops obtained a second surveillance video, which was recorded by a camera attached to Harrison’s bar. That tape was reportedly missing three minutes of footage, due to a blank section of the recording that began just as the suspect was about to come close enough to the camera to be identified.